Providing no-nonsense web and mobile software development services. Based in the small city of Lichfield, Staffordshire, we create reliable and standards compliant CMS, LMS, e-Learning and HL7 integration solutions for our clients. 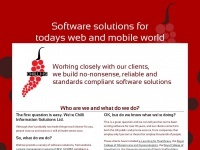 two profiles were found for Chilli-is.co.uk in social networks. Among other social networks the website is represented in Twitter and LinkedIn.